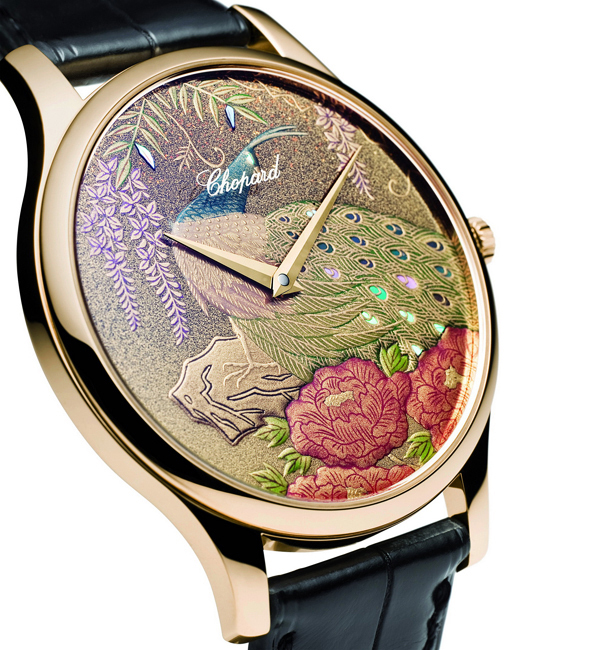 Swiss luxury watchmaker Chopard introduced unique collection of luxury watches called XP Urushi. 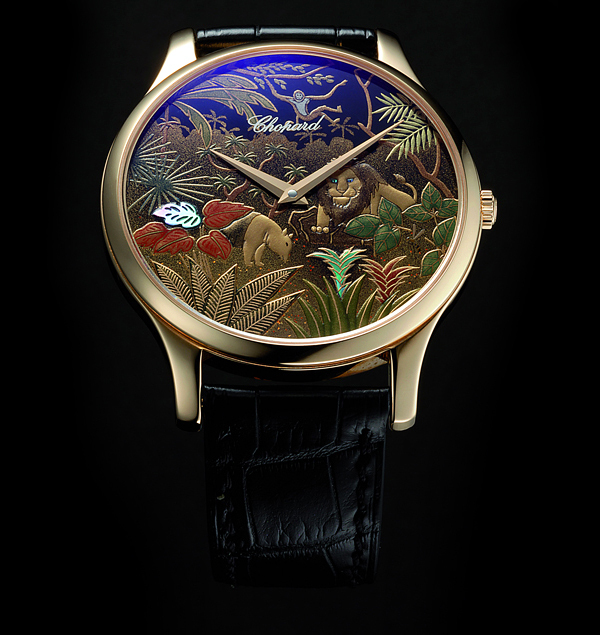 Kiichiro Masumura, a Japanese artist, considered to be a “Living National Treasure” by his country, has supervised the creation of nine unique dials based on Urushi techniques. Urushi is the ancestral Japanese art of lacquering. The varnish is made from the sap of the Urushi tree (lacquer tree), a tree which is mostly found in Japan or China. The harvesting of the resin can only be done once a year and in very small quantities. 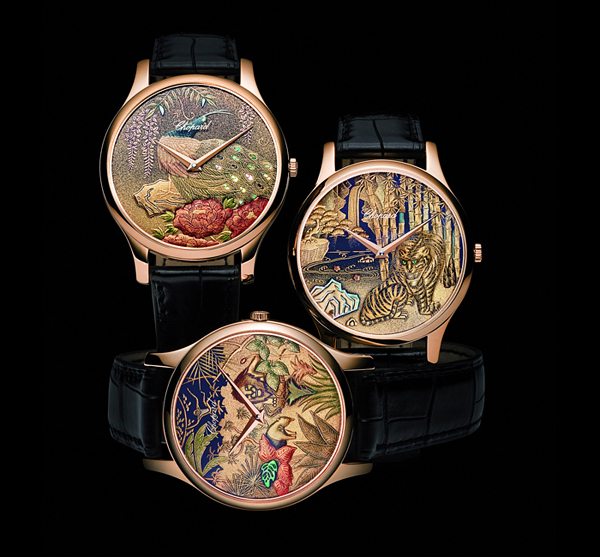 "Three to five years after being harvested, the resin is treated to make an extremely resistant, honey-textured lacquer. It is applied in exceptionally fine successive layers. 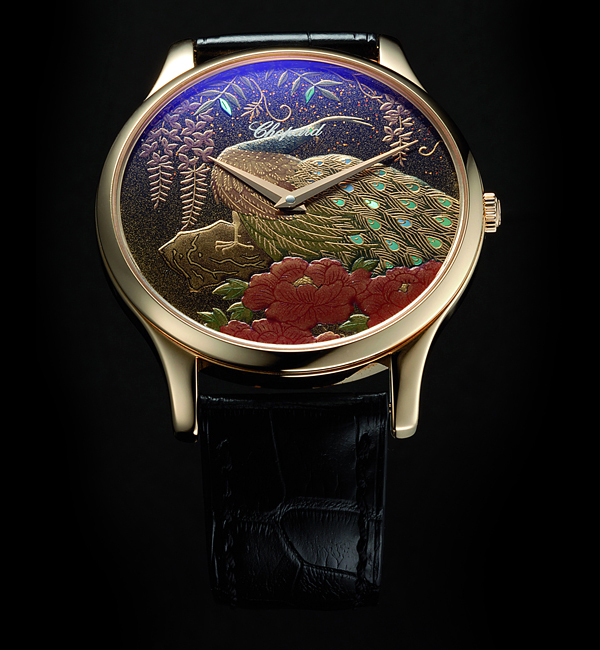 Maki-e is a specific Urushi technique that consists of sprinkling the lacquer with metal powder – in this case gold – in order to accentuate its contours. The gold dust is applied using bamboo tubes and small brushes made from rat’s hair, in order to trace extremely fine lines. This art calls for extreme expertise and only a few "Urushi Masters" – including Kiichiro Masumura – still exercise it today with consummate skill." 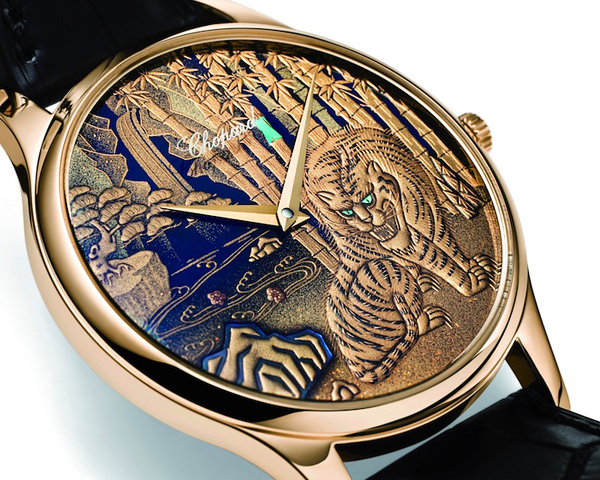 Chopard presents a collection of nine different dials technically supervised by Kiichiro Masumura and designed, painted and adorned with gold dust by the Yamada Heiando Company an official supplier to the Emperor of Japan. These works represent the five basic elements of the universe according to the ancient philosophy of Chinese natural science, and one portrays the universe itself. The five legendary creatures – the dragon with a blue horn, the phoenix, the qilin in the moonlight, the crouching tiger and the genbu (a blend of precious snake and tortoise) respectively evoke wood, fire, earth, metal and water. 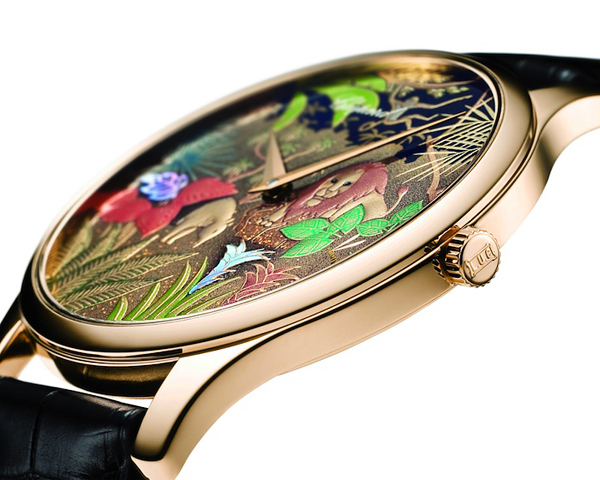 The last three dials feature a peacock, a red fish and the jungle. 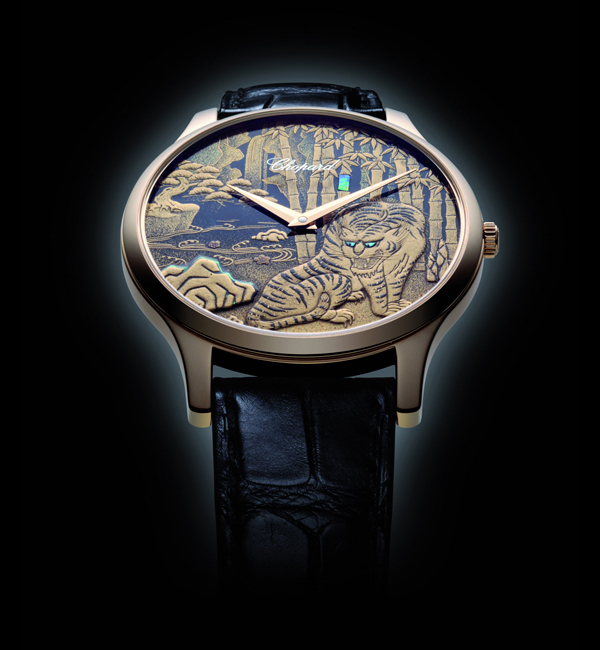 Each meticulously painted and unique model reveals a wealth of original details imbued with a deep sense of poetry. 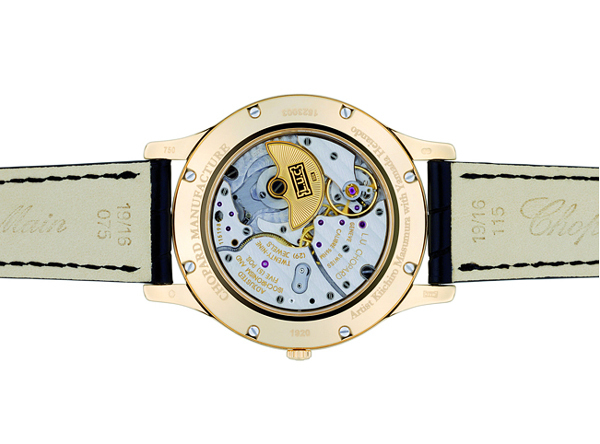 Stunning watch and this is not a surprise since Chopard is the most luxurious watch brands.